Our largest and oldest greenhouse is affectionately named “Chuao”, after a South American cocoa village visited by farm students in 2009. Chuao is thirty feet wide by ninety-six feet long and houses five beds. On one side, there is a raised table running the entire length of the greenhouse. This table protects our seedlings before they are transplanted in the greenhouses and in the field. A plastic covering rolls down to insulate the seedlings overnight and provide them with a humid environment in which to grow. Typical produce grown in the greenhouse is lettuce, mesclun mix, radishes, herbs and eggplant. In cooler months, heating is the main priority in the greenhouses. All of our greenhouses run east to west, meaning that length-wise, they each have a side facing south where the sun hits most directly. Unlike the other greenhouses, Chuao is specially equipped to maintain heat. A double-layer of plastic inflated by a blower is a simple way to conserve heat by providing a buffer zone of air between the warm interior and the cool exterior. Chuao is also fed by a solar hot water heater. For more info visit our Solar page. 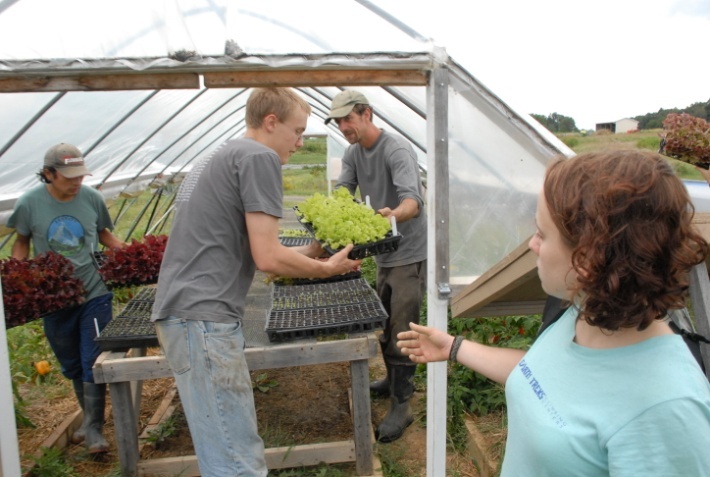 The farm has three high tunnels, which are unheated, lower-cost versions of the standard greenhouse. 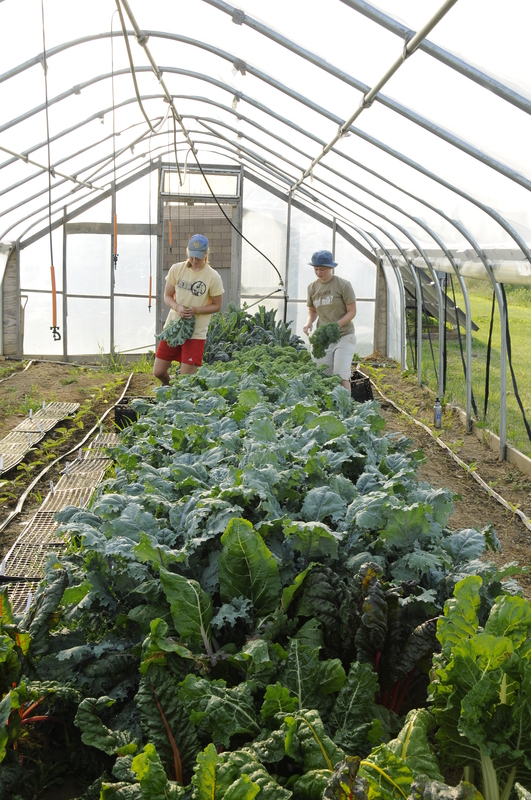 Our high tunnels use passive ventilation for air exchange and cooling and an irrigation system for crop production. 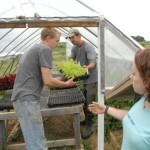 “Hoophouse” is another term that is interchangeable with “high tunnel”. A s you can see in the photo on the left, the plastic sheeting on the sides of our high tunnels roll up to provide a means for air ventilation and cooling. 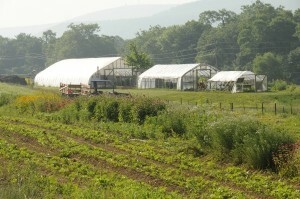 High tunnels, as a hybrid of open field and greenhouse production, provide a protected environment to extend the season and increase yield. In the summer of 2008, Preston Smith ’08 and other farm students built three efficient, circular housing structures inspired by the traditional Mongolian-style hut. The yurts house the farm’s graduate interns, who are either recent Dickinson graduates or members of the Multicultural Exchange for Sustainable Agriculture Program (MESA). 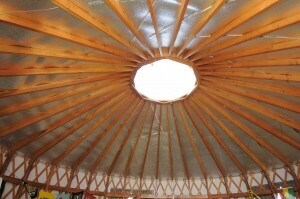 Smith used his construction expertise and collaborated with a local construction company to built the floors and platforms for the yurts. Students and interns then installed the wooden lattice structures that are covered with weatherproof fabric. 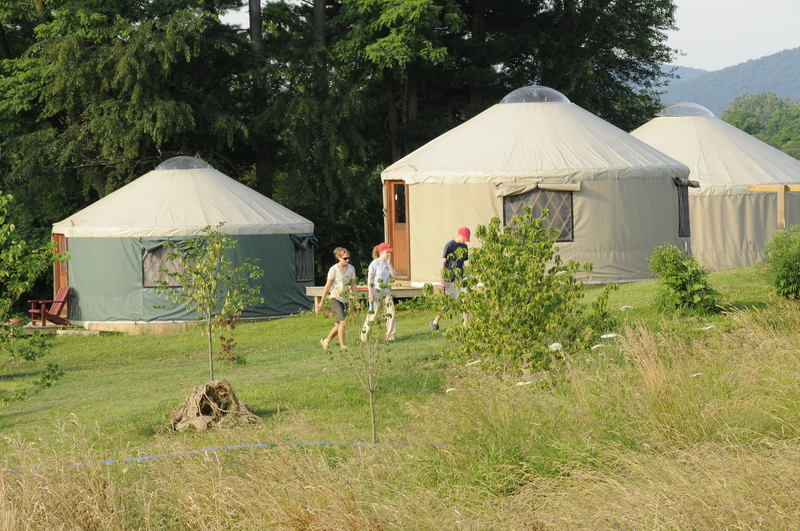 Solar panels are used to power electric lights and small appliances in the yurts. 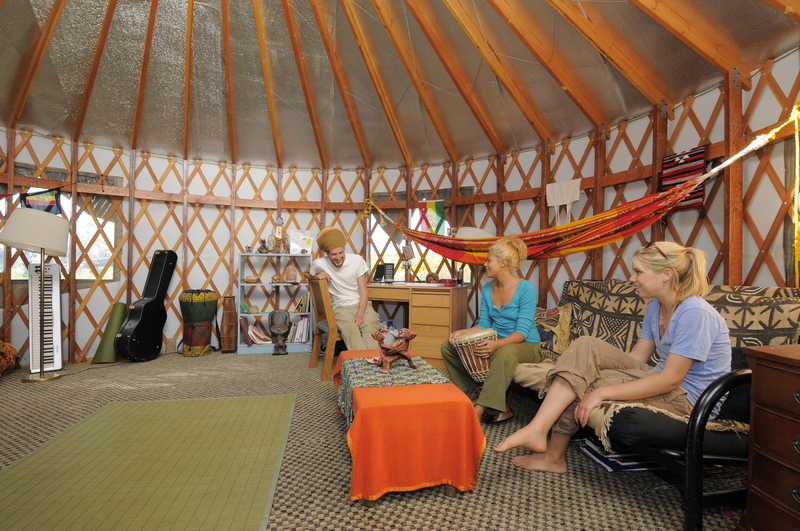 Each yurt is twenty feet in diameter with plenty of space for a bed, closet area, table, bookshelf and futon couch. A nearby building houses a communal kitchen and bathroom. 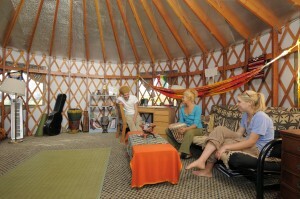 The yurts are also equipped with wi-fi and wood stoves for heating in the fall. Resident farm interns appreciate the opportunity to live in a pleasant, quiet space close to the place of their daily labors. 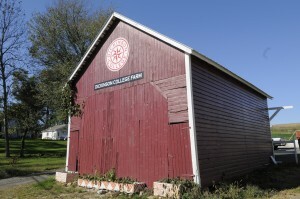 The barn is the main infrastructure on the farm for food processing and events. 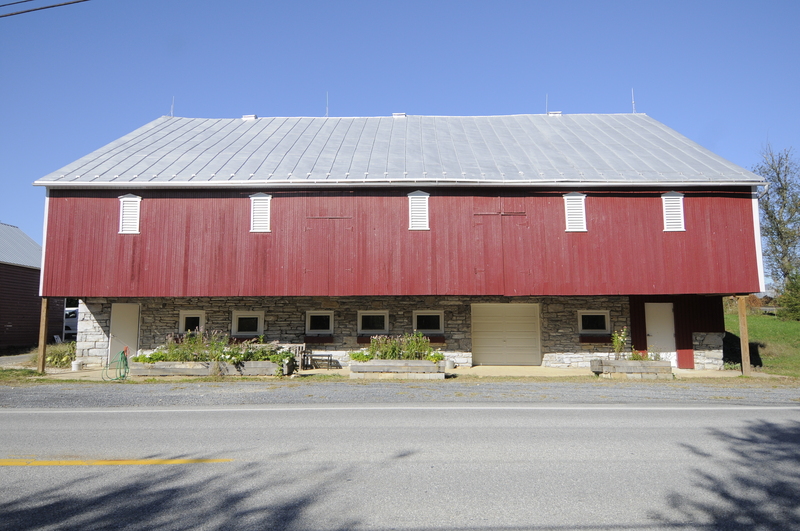 The upper level of the barn is an open space for storage, classes, social events, and barn dances! One of the largest farm events of the year is Harvest Fest. The lower level includes our CSA pickup area, produce washing and preparation stations, and a walk-in refrigerator to store our products prior to delivery. 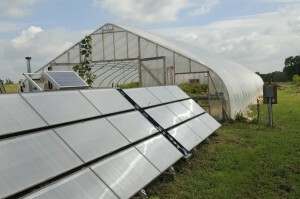 A large solar array in the barnyard produces about half of the electricity consumed by the barn year-round. The system is grid-tied, meaning it is linked to utility via a special inverter. When the barn is not in full use, the extra energy provided by the solar panels is returned to the utility as energy for the rest of the community. 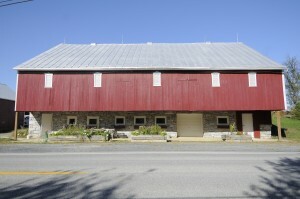 The structure is a “Bank Barn”, otherwise known in the US as a “Yankee Barn” or a “Pennsylvania Barn”. 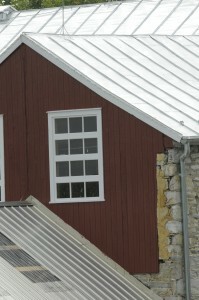 In the US, this style of barn was commonly built from 1820-1900. These barns are “banked”, or set into the side of a hill to allow access, on ground level, to both the upper and lower areas. The overshoot or forebay is an area of the barn’s upper level that extends beyond the barn’s foundation. In its present use, the forebay provides shelter to CSA customers and workers coming and going from the packing house and vegetable distribution area. The smaller of the two barn structures is our corn crib. A corn crib is a type of granary used to dry and store corn. 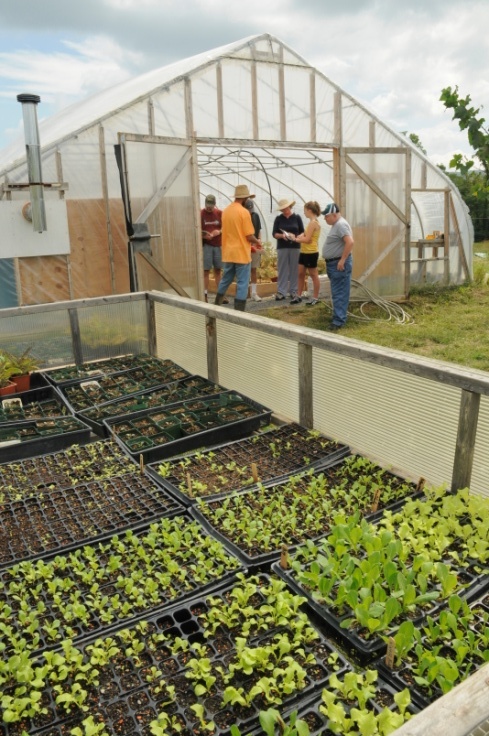 Currently, the crib is mainly used a storage facility for tools and supplies needed for the vegetable farming operation.